If you’re thinking of hiring a freelance administrator, chances are you’re short on time. It’s a common problem amongst small business owners and one that’s not always an easy fix. 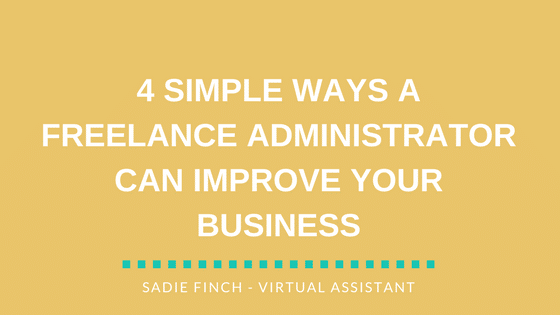 In this post, I want to talk about 4 key ways that a freelance administrator can not only help you to get more done but can also make your business better. Why? Because I truly believe that bringing in outside help (in the form of a versatile, skilled and experienced administrator) is one of your best options. They understand that, in order to be successful in business, they need to learn to delegate. Running a business is tough, and no one can do it single-handedly. Yet all too often small business owners find themselves stuck working long hours. Not only are they working long hours, but they’re doing things they never even imagined they’d have to deal with before they launched their business. We business owners get bogged down with things like finance management, making travel arrangements, typing up notes from meetings or keeping on top of a CRM. Yet, if we think about it logically, we know that’s not the best use of our time. You’re the heart and soul of your business. You know it from the ground up and if anyone’s going to drive it forward and take it to where you want it to go, it’s you. But – and this is a big but – you’re never going to make that happen if you spend all your time juggling the little stuff. Make sure you get plenty of time to work on your business; don’t waste all your time working in it. Are you drowning in an overflowing inbox? Do you struggle to get posts out regularly on social media? Are your digital folders in chaos? These are just a few examples of what a freelance administrator can help you with. An experienced administrator will have the skills and know-how to suggest and implement smarter processes across a wide range of tasks and projects. When I say ‘smarter processes’, I’m talking about using apps and tools to help organise and prioritise your workload. I’m also talking about putting systems in place to help manage your workflows and cut down on the amount of time each task takes. Putting smart processes in place can help save you a lot of time and effort. Not only will this make it quicker and easier for you to get your business admin work done, but it’ll also help you to feel more organised and in control of your business. This will give you the confidence you need to work towards your longer-term goals. We all make mistakes when we’re over-worked. What’s vital is that we don’t let our own busy schedules impact the work we do for our clients. If your ability to produce the level of work your clients expect is hindered, that’s a sure-fire sign that you’re ready to take on some outside help. There’s no room for poor quality. Not when you’re facing so much competition for business. Speaking of quality, there’s something else that slips when we’ve got too much on our plates, and that’s customer service. I’m not talking about the physical work you do for your clients here. I’m talking about the time you take to talk to them, to answer their questions, to listen to their concerns, to be available for them when they need you. All that stuff matters, it really does, and if you don’t have time for it, you risk losing business. Have you thought about using a call answering service? Or having someone manage your calendar and your inbox? No matter how committed you are to your business, there’s only so much you can achieve on your own. There’s no magic spell to bump each day up to 25 hours instead of 24. Also, no matter how many times the business ‘gurus’ on LinkedIn tell you it’s possible, no one can function properly on only 4 hours sleep. The reason you started your own business was that you wanted more flexibility, more independence and less stress. You knew it’d be tough for the first couple of years, but you also knew there was a better version of work-life balance waiting for you somewhere in the near future. If you’re stressed and running on empty, your chances of getting to that place quickly are diminished. You can’t possibly produce your best work if you’re under too much pressure. Nor can you make the best decisions for your business. By outsourcing to a freelance administrator, you can claim back the time you need to move your business forward. Whatever’s important to you right now – whether it’s taking steps to grow and expand your business, or being able to lighten the load and spend more time with the ones you love – hiring a freelance administrator could be the ideal solution. For a free, no-obligation consultation, drop me an email today at sadie@sadiefinch.com. Or come say hi on Twitter and follow me for helpful business management tips and friendly chatter about life as a small business owner and all that goes with it.